Norman & Underwood has almost 200 years experience as a lead roofing contractor and is the UK’s largest and oldest manufacturer of traditional sand cast lead. Lead has been an integral part of the design and construction of many of our finest buildings since Roman times, providing excellent durability, flexibility and aesthetic appeal. Many of the skills and processes used by our craftsmen today are virtually the same as those used by their predecessors at the company in the 19th century. We still produce our own traditional sand cast lead, which has been used on major restoration projects across the UK, including Salisbury Cathedral, Chatsworth House and Westminster Abbey. 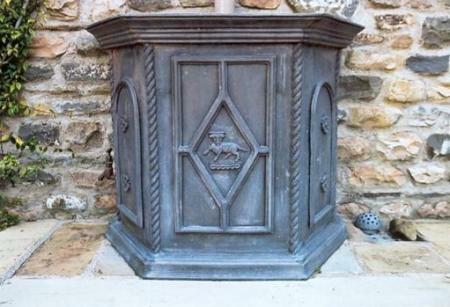 We can also supply rolled and machine cast lead, together with lead slates, rainwater goods, hopper heads, decorative roses and finials and other ornamental leadwork. Norman & Underwood are suppliers of rolled lead sheet to British and European Standard BS EN12588:99. We carry stocks of rolled lead in codes 3, 4 and 5 for roofing, flashing and soakers. Almost any size and thickness can be provided – please contact our Trade Counter for further details and prices. For historical restoration projects, or new builds where a more attractive finish is required, we can produce sand cast lead to order in codes 6 to 12. We still use traditional processes to ensure it retains the natural shiny blue colour and grained texture. You can read more about how we cast lead in Lead Casting. We also refine scrap and recycled lead into lead ingots suitable for ballast. Please contact us for information on availability and latest prices. A fine example of Conservation/ Restoration we are very pleased.